The quote appears in Areopagitica, a defence of free speech written by Milton after visiting the famous astronomer Galileo in 1638. Galileo was then under house arrest in Italy, having been forced by the Inquisition to recant his theory that the earth revolved around the sun. 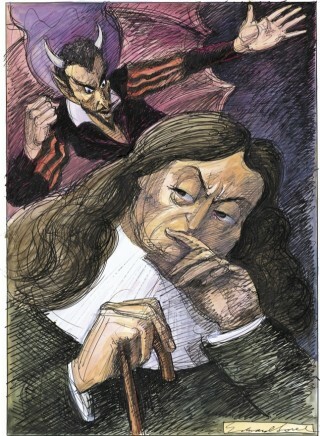 The New Yorker article, Return to Paradise, June 2, 2008, describes Milton’s visit. The article contrasts the modernity of Galileo’s view of the world, with Milton’s rather more old-fashioned notions of God at war with his rebel angels. What I find interesting is that the English poet seeks out a scientist and in some ways sees him as a kindred spirit–a man struggling to understand and convey a picture of the universe. In this post, I focus on Milton’s definition of a good book. The definition is one sentence charged with several metaphors and paradoxes. For instance, “precious life-blood” is a metaphor referring to the human body. In 1628, Milton’s English contemporary William Harvey published his book De Motu Cordis, outlining for the first time the precise way that blood circulated within the body. This “life-blood” contrasts with a “master spirit.” A spirit is immaterial: a personality, a way of thinking and being. The blood of a spirit or immaterial being is a paradoxical concept as ghosts usually lack physical attributes like blood. To modern ears, the phrase “master spirit” sounds pompous and ominous, emerging out of an era of masters and slaves. Slavery was not abolished in England until 1833, a century and a half after Milton’s death. 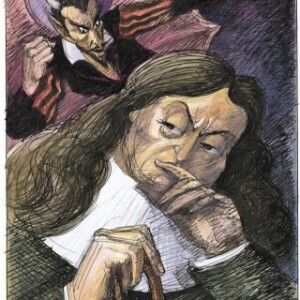 However, Milton most likely meant “master” in the sense of “master of himself,” an independent thinker. The phrase “master spirit” also reminds me of the apprentice system. One is not born an artist; one learns to be an artist through experience and the mastery of a craft. Canadian critic Northrop Frye uses the phrase “the educated imagination” in much the same way. When Milton combines these two metaphors, “the precious life-blood of a master spirit” he suggests that books have a physical element that relate to the laws of nature and science, as well as a spiritual aspect that is more elusive but still shaped by tradition, upbringing and study. Milton’s phrase “embalmed and treasured up on purpose to a life beyond life” presents a fascinating mixture of associations. Embalming was practised by the royalty in Britain at this time. For example, King James I had his two-year-old daughter Margaret embalmed when she died in 1600. This same period saw a proliferation of funerary monuments, and the wide-spread use of epitaphs on graves, identifying the occupation and interests of the deceased, reflect a new belief in the importance of the individual. “Embalmed and treasured up” the writer acts as mortician and pirate. He is both preserver and thief, with his stolen observations of a particular time and culture. This buried treasure is hidden and the readers of a good book must uncover the rich secrets that lie within. There is a further implication that the value of a good book, like buried treasure, increases as it lives beyond the disappearance of the world in which it was created. That it can give “life beyond life” gives a book a kind of supernatural power. Through books, we move forward and backward through time and converse with the dead. Books promise fame and immortality to their creators, but anyone who reads a book written in the past, participates in this powerful exchange that exceeds the limits of a single life. Milton uses the word “life” three times in his short definition. Life can mean vitality, as in “he is full of life.” There are kinds and degrees of life: “a life of action and purpose” or “a meager, frightened life.” When we say, “Tell me about your life,” we are asking for a story. A good book is above all else a good story. Ecology is the study of the interaction of many life-forms, as when we speak of “life on earth.” Life beyond life suggests resurrection and a religious state of nirvana or transcendence. There’s a paradox in this as well. When Milton says, “life beyond life,” isn’t this the same as saying “life beyond death”? Life is also death. A good book is a recognition of this and also an escape from it. It is a recognition of the human condition, with an escape clause built in. In summary, a good book for Milton is blood, spirit, monument, treasure and time capsule. It is life, but also death and an escape from death. That’s quite a definition. This entry was posted in Literature by dougcube. Bookmark the permalink.